Johann Sebastian Bach, composer, violinist and keyboard virtuoso, was born on March 21,1685 in Eisenach, Germany and died on July 28, 1750 in Leipzig, Germany. Today, he is probably the most famous composer of the Baroque Period in music (1600-1750) and definitely represents the culmination of Baroque style. He is best known for his composition for keyboard, especially organ, and, because he was employed as a church musician, his religious works: the Mass in B Minor and Saint Matthew Passion are perennial favorites at Christmas and Easter, respectively. 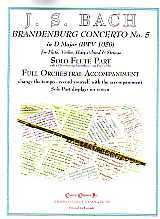 The 6 Brandenburg Concertos were dedicated and sent to the Margrave of Brandenburg (1677-1734) in 1721. They were composed while Bach ran the court orchestra in Cöthen, between 1717 and 1723, the same period in which the first two of his four Orchestral Suites were written. Bach had a Chamber Orchestra (i.e., relatively small) in which he played principal Viola (and Harpsichord) and his patron, Prince Leopold of Cöthen (1694-1728) often played Viola da Gamba, and the instrumental of the Brandenburg Concertos reflects this. No. 6 in Bb Major (BWV 1051) Strings (without Violins) & Continuo (Harpsichord & Cello). Concerto No. 4 is often referred to as a Violin Concerto - it was “re-used” as the music for his Keyboard Concerto in F Major (BWV 1057). Likewise, Concerto No. 5 is often called a Keyboard Concerto but neither is a Solo Concerto.